The New Mexico Transportation History Project (NMTHP), a not-for-profit entity, frequently purchases license plates and related items for the sole purpose of photographing them. Once photographed the images are posted on the NMplates.com website, at which point we have no further use for the plates themselves. These items are then made available for purchase by interested parties at or below our actual cost of acquisition. We make no profit on these sales. In the past we have typically listed these items for sale on eBay, a time consuming process which adds to our cost through the fees we have to pay, thereby driving up the resale cost. For this reason we’ve established this “License Plates For Sale” page on NMplates.com where our photography subjects will be listed as they become available. Important: We cannot accept consignments or plates from any other source for resale on NMplates.com. cost figure for each item. Combined Shipping Note: In most cases we can save you money on shipping when you buy more than one plate at the same time. Please ask for a combined shipping cost when inquiring about multiple plates. us by email to verify that the item is still available. Once availability has been verified payment may be made by PayPal. Shown below are the items currently available for purchase. 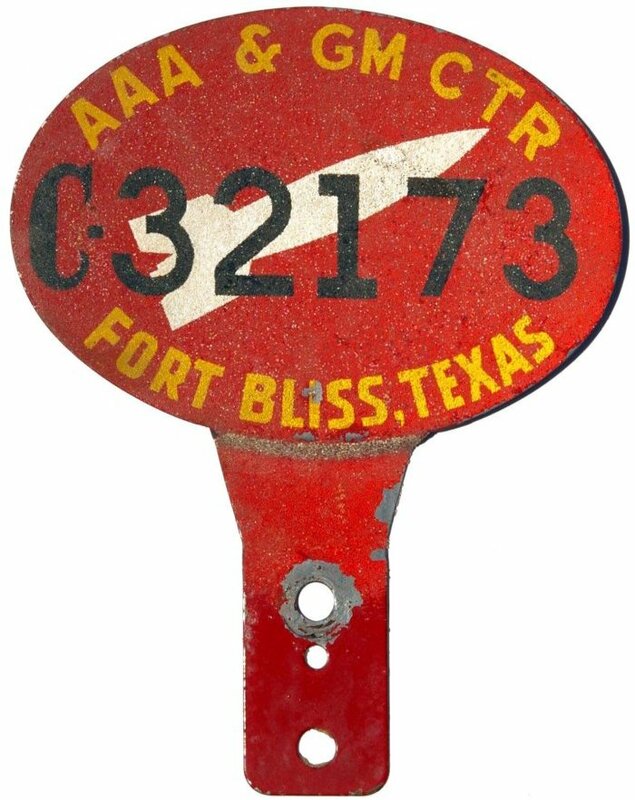 1940s – 1950s Ft. Bliss, Texas, Anti-Aircraft Artillery and Guided Missile Center license plate attachment. Note image of V2 rocket in center. Though Ft. Bliss headquarters is in Texas, its missile firing range and most of its land area is in New Mexico. The attachment showed the Army base gate guards that the vehicle was authorized to enter. Manufactured using glass bead reflective paint. The oval part of the attachment measures 3" x 4¼" and the overall height is about 5½". $135 plus $7.65 Priority Mail. Combined shipping available for purchase of multiple plates. Complete Passenger Balloon Plate Type Set. Includes one example of every type of Passenger Balloon plate issued, including the exceedingly rare Type 8. The Type 8 was issued only when the owner of a yellow yucca plate requested a replacement plate and the MVD chose to reissue it with the same serial number on a Balloon plate. There is only one example of these known to us, and not only is that example included in this set, but we also include the sun-bleached yellow yucca plate that it replaced. Total of 9 plates included. You can read more about Balloon plates at: https://nmplates.com/BalloonPlates.htm. Complete set of all 9 plates, $115 plus $7.65 flat rate Priority Mail shipping. Combined shipping available for purchase of multiple plates. Unissued matched pair of 1941 Passenger plates with original mailing envelope bearing matching serial number. While unissued plates in their original envelopes are common for several years in the early 1930s, such plates from the late ’30s and early ’40s are seldom – if ever – seen. We have personally never seen another such pair from 1941. See closeup photos of the envelope and one of the plates at: https://nmplates.com/MailingEnvelopes.htm IMPORTANT NOTE: While these are unissued plates, the envelope is in only fair condition. The plates are exceptionally nice but have some light scuffs on some of the characters, and have a few very small spots of what appear to be stuck paper from the envelope, which we have not attempted to remove. $249, plus Priority mail shipping of $7.65. Insurance, if you want it, would be $4.50 additional. Combined shipping available for purchase of multiple plates. County Run. Complete New Mexico 32-plate county run on the iconic 1965 red-on-yellow base. It’s now nearly a half century since the last New Mexico passenger plates were issued with county numbers, and it has become excruciatingly difficult to assemble a complete New Mexico county run. Here’s a chance to acquire a ready-made county run at one fell swoop without the years of grief and toil that would be required to locate these plates one by one. The price for all 32 plates is $875. That’s less than $28 per plate! Flat rate shipping via Priority Mail is $14.35. We recommend full insurance against loss for an additional $14.00, but that is your choice. If there are other plates you want to purchase, we can fit a few more plates in this box at no additional shipping cost. 2001 Demonstration Permit. Early example of a New Mexico Demonstration Permit, from the period when the state was transitioning away from using Dealer plates for this purpose. The plate is made of thin card stock and is glued on the back to a dealership promotional plate made of what appears to be fiber board. Note chips, small tear, stains, etc. $5 plus $7.65 flat rate Priority Mail shipping. Combined shipping available for purchase of multiple plates. Turquoise Handicap plate. Somewhat scarce, if not exactly rare, and not often available. Note that the clear coat has been disturbed at the bolt holes, but otherwise excellent condition, and cheap! $15 plus $7.65 Priority Mail. Combined shipping available for purchase of multiple plates. 1983 WD-IR Weight Distance / International Registration Plan. This plate, is by all appearances a combination of the Weight Distance and International Registration Plan types. It is not described in the MVD publication New Mexico License Plates 1984 Edition, though that publication does show the regular 1983 Weight Distance plate with the embossed “83.” Apparently very uncommon, as only one other example known. Unissued. $23. Priority Mail flat rate postage of $7.65. Combined shipping available for purchase of multiple plates. Freight Trailer, Permanent. This is an unissued plate, believed to be of the style currently being issued. $14. Priority Mail flat rate postage of $7.65. Combined shipping available for purchase of multiple plates. Freight Trailer plate, circa 1991. Scarce example of the first style of this type upon the change of the prefix from FR to FT. $12 plus $7.65 Priority Mail. Combined shipping available for purchase of multiple plates. 1962 Trailer plate with unique sticker. Like Car and Truck plates, 1962 Trailer plates were provided as undated 1961 base plates with a generic red-on-yellow 1962 validation sticker. This example, however, received a purpose-made 1962 Trailer sticker, and is the only one of this style known to exist. For a comparison, see the Varieties page here, and scroll down to 1962. Plate is in only fair condition. $19 plus $7.65 Priority Mail. Combined shipping available for purchase of multiple plates. 1936 Charles Henry Davis plate #025. Professional repaint. Details about Charles Henry Davis can be read here, and also in the article beginning on p. 16 of the October 2018 issue of PLATES magazine. $110 plus $7.65 Priority Mail. Combined shipping available for purchase of multiple plates. 1955 Holloman Air Force Base license plate attachment with the 1955 Otero County plate it was originally attached to. The attachment showed the air base gate guards that the vehicle was authorized to enter. Manufactured using glass bead reflective paint. The oval part of the attachment measures 3" x 4¼" and the overall height is about 5½". The 1955 New Mexico plate is the standard size for that year, i.e., about 6" x 13¾". $145 plus $7.65 Priority Mail. Combined shipping available for purchase of multiple plates. ORIGINAL bound volumes of the Santa Fe New Mexican newspaper, 1916-1937. These newspapers were hand-bound by the New Mexico State Library/New Mexico State Museum shortly after publication, and were kept in the library’s and museum’s stacks until microfilm replaced them in the 1950s. The original bound volumes were then sold to the public at that time. They passed through several owners before the New Mexico Transportation History Project (NMTHP) acquired them for research purposes over a decade ago. That research is now complete and we are ready to pass them along to other persons. Please click here to see full details, price, etc., along with a complete list of the dates of these volumes. Total price for both plates, etc., $110 plus $7.65 flat rate Priority Mail shipping. Combined shipping available for purchase of multiple plates. 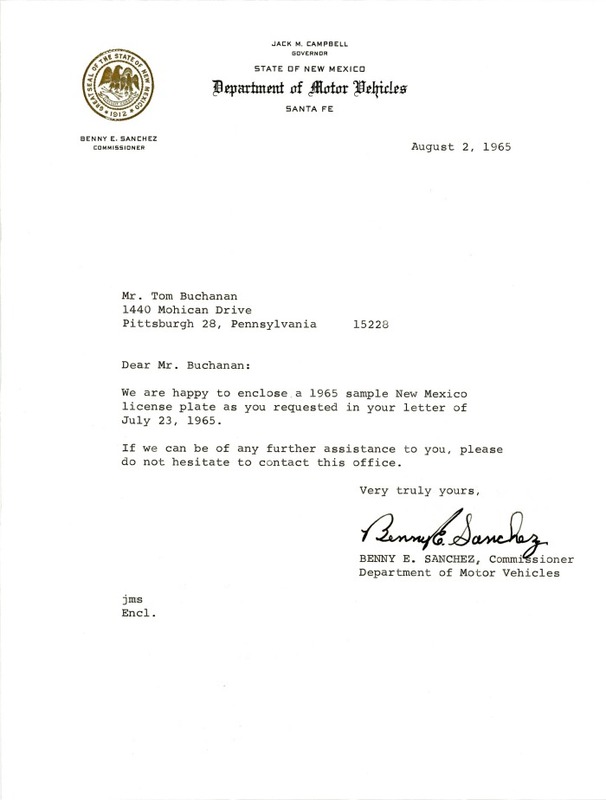 1965 Sample plate with original mailing envelope and original signed transmittal letter from Benny E. Sanchez, Commissioner of Motor Vehicles. The white envelope containing the transmittal letter was originally taped to the front of the plate mailing envelope, but over the years the cellophane tape dried out and fell off. IMPORTANT NOTE: Although it cannot be seen in the photo, the transmittal letter is slightly yellowed with age, and has several creases from having been inadvertently folded over. $35.25 plus Priority Mail shipping of $7.65. Combined shipping available for purchase of multiple plates. Booster Plates. The Estancia Bears plate is plastic, whereas all the others are metal. All are flat plates other than the Fighting Coyotes Roswell plate, which is embossed. All are 6" x 12" plates except Roswell plate is 4" x 12". Priced at $15 each or all four for $55. Priority Mail flat rate postage of $7.65. We can get 1, 2, 3, or all 4 of the plates in the package for the one price of $7.65. Combined shipping with other plates available as well. 2 Weeks in New Mexico. 1939 booklet, 4" x 9", 32 pages, 66 black & white photos. 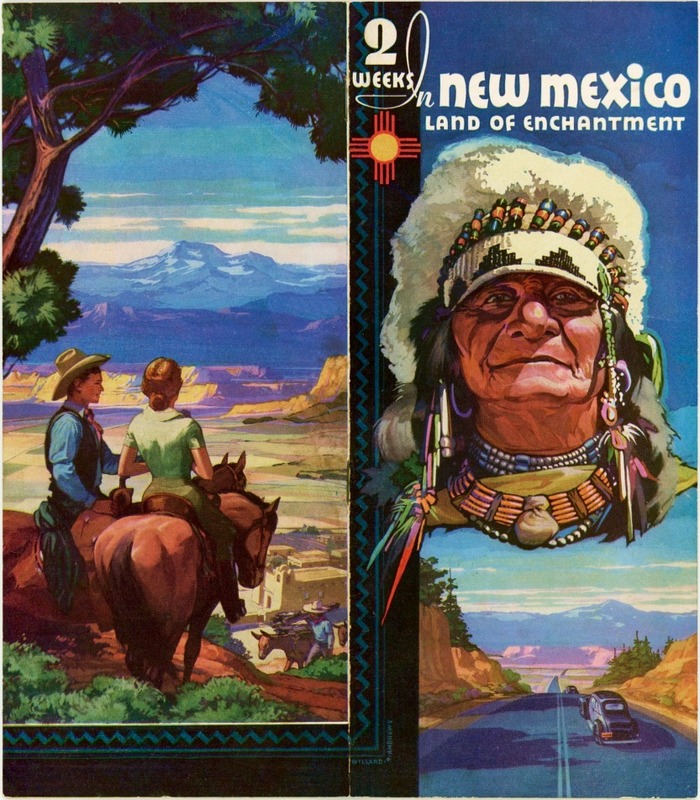 Published by the New Mexico State Tourist Bureau, which was created in 1935 as a division of the State Highway Department. The cover paintings were done by New Mexico artist Willard H. Andrews, whose work also appears inside the booklet, as well as on other N.M. Tourist Bureau publications. IMPORTANT NOTE: The booklet is as issued, with no apparent fading, but the lighting used in the photography of this item makes it look somewhat brighter than it actually is. $22. Mailed as First Class Package, $3.75. Combined shipping available for purchase of multiple items. 1931 Taxi, 2-digit, plate #12. This plate, one of a matched pair acquired by NMplates.com, is an extremely rare example of an early New Mexico commercial plate, and the two plates of this pair are only known surviving 1931 Taxi plates. The original registration information for this plate shows that it was registered to Southwest Tours of Santa Fe, for a 1928 Cadillac sedan, serial number 327005, weight 4965 lbs. Note that the weight/capacity tab on the plate confirms the weight figure. IMPORTANT NOTES: As can be seen in the photograph, there is paint loss on the left side of the plate. Also, someone in the distant past, and for unknown reasons, painted part of the back side of the plate with aluminum paint which ran around to the front where it is seen on the left border and part of the bottom border. There is at least one nail hole, to the upper right of the serial number. A 1¼" long crack can be seen under the top right bolt hole. Only ONE plate of the pair is for sale here, the one shown in the photograph, and it is being sold below our acquisition cost. $475 plus $7.65 flat rate Priority Mail. We recommend full insurance for an additional $6.80, but that is your option. $24, plus $7.65 flat rate Priority Mail shipping. Combined shipping available for purchase of multiple plates. 1947 Truck plate with two die types on a single plate. Truck plates from 1930 to 1953 included the word TRUCK vertically at the right hand side. This took up a certain amount of space, with the result that for a few number combinations, in order to squeeze in all the required digits, it was necessary in rare instances to use a sans serif die for the numeral “1”. In this unusual example, both die types of the numeral “1” appear on a single plate. This plate is unissued and very nearly perfect, making it an excellent choice for either your Truck plate collection or a display of plate varieties. $48, plus $7.65 flat rate Priority Mail shipping. Combined shipping available for purchase of multiple plates. 1946 Staff Officer. Issued to cronies of the Governor, to whom he had given the honorific title of “Colonel.” 1946 was the last year of issue before the state legislature banned the issuance of numbered plates bearing this or any other similar special designation. The ban came about because of a perceived abuse of the Governor’s office, as these “Staff Officers” had no duties and did no work. $45, plus $7.65 flat rate Priority Mail shipping. Combined shipping available for purchase of multiple plates.